A new white paper published on January 28, 2019 examines the potential impacts of using natural gas as a fuel for ships and trucks. This study — Can natural gas reduce emissions from transport? — looks at how using natural gas affects greenhouse gas (GHG) emissions, air pollution, and cost to industry. The paper was co-written with academics at the Imperial College London’s Sustainable Gas Institute and Centre for Transport Studies, and the UBC’s Natural Gas Futures. Natural Gas Futures researchers, Dr. Amir Sharafian, Dr. Paul Blomerus and Dr. Walter Mérida, investigated the evidence surrounding emissions from natural gas use in ships. 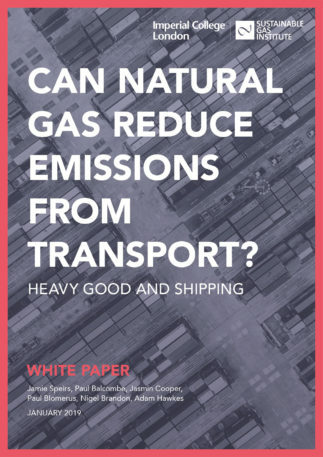 The key finding is that liquefied natural gas (LNG) offers significantly improved air quality impacts and moderate reductions in CO2 emissions when used as shipping fuel. Air quality impacts are reduced by 80% to 90%, with the exception of NOx emissions from high-pressure dual-fuel (HPDF) engines. The paper also highlights that quantifying and mitigating methane emissions from ship engines are essential to ensure the emissions reduction potential of LNG. In fact, two of the four LNG-fueled engines investigated in this study would produce unacceptably high methane emissions and result in negative environmental impacts. The overall GHG emissions from LNG-fueled ships shall be an integrated consideration of the carbon intensity of the gas supply, the ship engine technology, and the operational practices of shippers. Comparing best estimates of both heavy fuel oil (HFO) and natural gas ships suggests a 10% lifecycle GHG reduction for LNG-fueled ships. The right policies, technologies and operational practices to minimize GHG emissions from the supply chain and ship engines need to be in place to validate this environmental benefit. “Without the right policies to achieve the cleanest gas extraction and liquefaction technologies and training for ship operators to use LNG engines in the most effective way, the emissions reduction potential of LNG is limited or even negative. Our evidence-based research collaboration with industrial partners and stakeholders is critical to validating the benefits, and to guiding the respectful and responsible use of our natural resources.” explained Dr. Walter Mérida, Director of the Clean Energy Research Centre and Natural Gas Futures. This study is particularly relevant to British Columbia which is positioned as a world-leading jurisdiction by supplying the cleanest LNG to the shipping sector. “Cleaning up our trade corridors will bring significant benefits for our environment, public health and economy. FortisBC sees the use of LNG in marine shipping as a great opportunity to demonstrate the role of BC resources in addressing a global issue,” explained Doug Stout, Vice President of market development and external relations at FortisBC Inc. Significant research efforts are undertaken at Natural Gas Futures to develop sustainable solutions for the responsible use of natural gas in the shipping sector. One research project led by Dr. Patrick Kirchen involves designing fast-acting instruments, measuring GHG emissions on LNG-fueled ships, and developing emissions mitigation strategies. The White Paper points to the need for earnest endeavours to limit methane emissions, a position already adopted by several global companies and organisation in 2018. Methane emissions refers to venting, fugitive (unintended) emissions, and incomplete combustion including flaring. Signatory companies BP, Eni, ExxonMobil, Gazprom, Qatar Petroleum, Repsol, Statoil, Shell, Total, Wintershall and Woodside contributed to the landmark document Reducing methane emissions across the natural gas value chain – Guiding Principles. The International Petroleum Industry Environmental Conservation Association (IPIECA), the International Gas Union (IGU) and the International Association of Oil and Gas Producers (IOGP) added their names as Associate Signatories. All have committed to undertake the principles, the implementation of which has been defined in a master plan. A concerted industry response is needed to increase focus on the reduction of methane emissions.